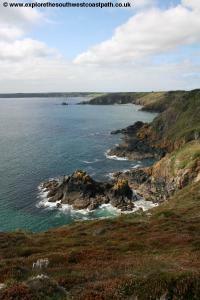 This walk takes in the most southerly point of main land Cornwall and England, Lizard Point and follows the eastern coast of the Lizard Peninsula. 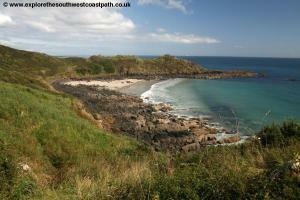 This east facing coast is more sheltered and offers a mixture of rocky headlands and sandy beaches, many of which are very quiet. There are however quite a few steep ascents and descents. Coverack is easily reached from the A394 road, the main road between Falmouth and Penzance and also easily reached from the A30 via the A39 and A390. On the A3094 on the south edge of Helston exit onto the A3083 signed for Lizard and RNAS Culdrose. Pass Culdrose and then turn left at the roundabout onto the B3293. Keep on the B3293 signed for St Keverne through Garras. From here the road opens out to cross Goonhilly Downs and then divides with one part going to St Keverne and the B3294 splitting off for Coverack, take the latter road and pass through the village. There are two car parks in the village, the main council run car park is the first one you reach on the right, just before the coast. This has the most space and is pay and display although it is worth nothing that part of the car park is usually in use by travellers. A few metres further along the road there is a community run car park with payment via an honesty box, a little closer to the coast. There is also a small community car park (with payment via an honesty box) at the far end of Dolor Point, at the end of the B3294 however space here is very limited. Despite this it may be worth considering parking in Helston and taking the bus from there to Coverack at the start of the walk (see the next paragraph for details), and then returning by bus from Lizard at the end of the walk to Helston. This is because there is no direct bus between Lizard and Coverack so you will end up changing buses at either Helston or RNAS Culdrose on the way back and this avoids the possibility of a long wait for the bus to Coverack which runs less often than the bus to and from the Lizard. It is also worth noting that at the time of writing, the last bus from Helston to Coverack is at 17:42 so you need to allow for the time taken to get from Lizard to Helston in time for this bus at the end of your walk, which is another reason to recommend parking in Helston and taking the bus to Coverack first. If you are travelling by public transport First Devon and Cornwall bus service 36 runs roughly once every two hours Monday – Saturday from Helston to Coverack. The journey takes around half an hour from the centre of Helston and most buses go to Coverack first and then St Keverne, but some go to St Keverne first and then Coverack, which takes a little longer. 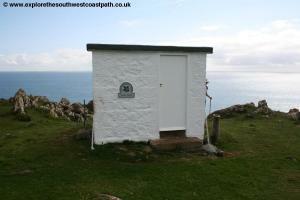 The bus stops right on the coast path, where it turns around, by the community car park. 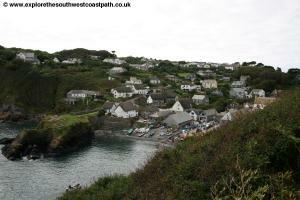 Although both Coverack and Lizard are small there is still a good choice of accommodation available. 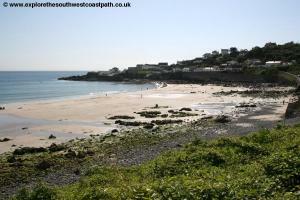 The Coverack.org.uk website has a listing of accommodation in Coverack. 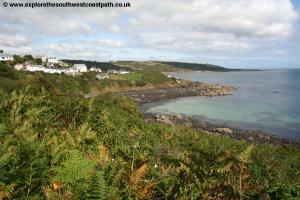 The Paris Hotel, Coverack is another hotel, which the coast path passes. At the Lizard end of the path, Lizard Point Youth Hostel provides accommodation both in shared rooms and private rooms and is at Lizard Point lighthouse. 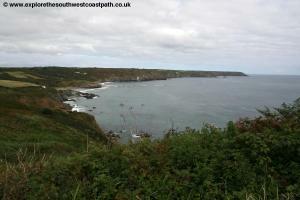 The Housel Bay Hotel is right on the coast path just east of Lizard Point at Housel Bay. 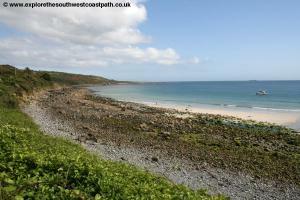 If you prefer camping, Heath Farm Camping is around 3 miles from Coverack. 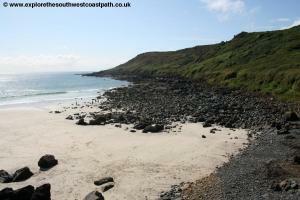 Little Trevothan Campsite is also close to Coverack as is Zoar Campsite. 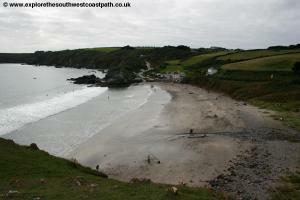 At the Lizard end Henrys Campsite is a campsite located in Lizard village. 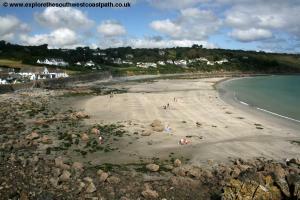 Coverack is a pretty village with a good sandy beach and a pretty harbour. From the bus stop or car park head down to the road with the coast on your right, passing the pleasant sandy beach and soon reaching the harbour. Pass the harbour on the left and continue past the Paris Hotel on the right and the lifeboat station on the left to the car park at Dolor Point. 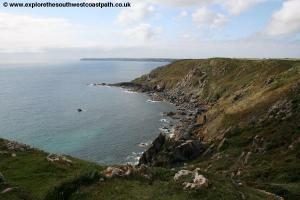 Here you can enjoy fine views to the east over much of the coast of Cornwall. 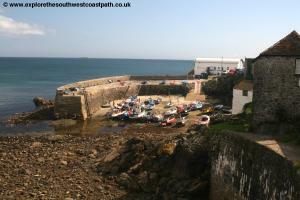 The coast path begins from just next to the beer garden of this pub at the far end of the car park. This goes alongside the pub and then just by a house turns to the right over what appears to be a small play area which I believe is part of the hall nearby. Here keep as right as possible to re-join the road which you turn left along and then as you come to the chapel ahead, turn left and take the surfaced path along it's left hand side past white-washed cottages on the right. As the houses end you have a choice of routes, the Inland Route which is easier but cuts out part of the coast or the Coastal route which is the official route marked on the map and listed on the signs as Challening with rocky surface. 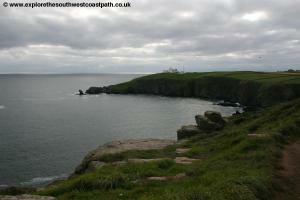 The route described here is the coastal route. 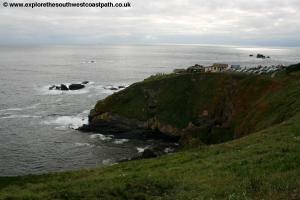 As the houses end you turn left to join the path along the low cliffs. 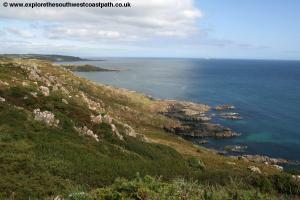 This soon forks, take the left most fork, the most coastal of the routes. As you apporach Chrynhalls Point the path goes right out to the end of the point although this is a dead-end path so you may opt to make a little shortcut here. 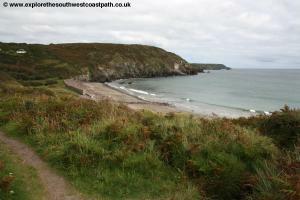 In either case you turn to the right with the coast and path here and soon reach a lovely beach, Porthbeer Cove which is rocky but has a lot of sand at low tide and it's isolated location and lack of parking means it's very unlikely to be busy. 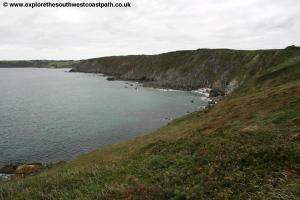 The coast path continues initially right along the back of the beach but soon begins to climb back up to the cliff top and when you join another path going left to right, turn left. 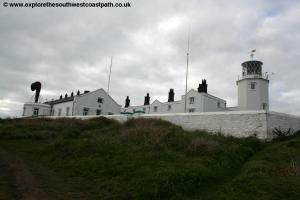 You now follow the meandering coast path along the cliff tops to the National trust owned Black Head which has a white building! Follow the obvious coast path west along the cliff top soon taking the path that goes down and rounds Beagles Hole where there is a little stream. 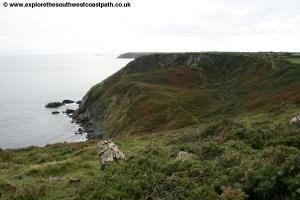 Climb back up the other side and continue on the obvious coast path along the cliff top which soon descends down to another larger valley, at Downas Cove. This is another remote beach which is rocky and pebbly at high tide but has some sand at low tide, although access is difficult. 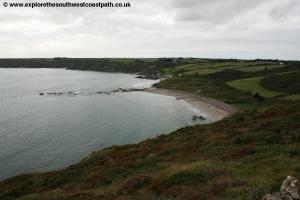 Continue west along the obvious coast path passing the little inlet at Zawn Vinoc and Lankidden Cove, another little beach with rocks at high tide but sand at low tide. 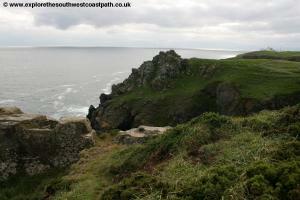 There is a steep path down on the left which goes to the beach, but unless you wish to visit the beach, keep to the main coast path ahead. The path misses out Lankidden headland , instead cutting west here although there is a path out to the end of the headland if you wish. 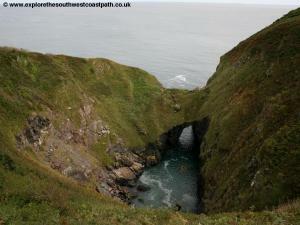 Continue west along the cliff top passing Spernic Cove another rocky and sandy beach although there is no access to this one. 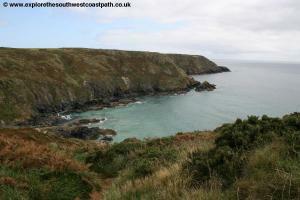 The coast path now hugs the coast, keeping right to the cliff top to reach Kennack Sands. This is essentially two adjacent beaches, the first a sand and shingle beach backed by a low sea wall and the second another mostly sandy beach with rocks at the far end, backed by grass and low cliffs. Behind the sea wall at the first part of the beach, take the track going a little inland to re-join the coast at the car park to the beach, where there are also toilets and a cafe. Continuing from Kennack Sands, take the road out of the car park heading west soon passing another small car park on the left. Just beyond this car park look out for the coast path sign on the left, taking you off the road along a track. 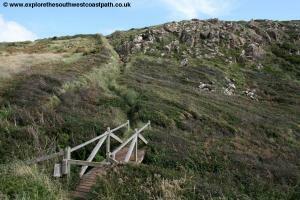 Soon the path turns left and then emerges onto the edge of a golf course, near a caravan site. 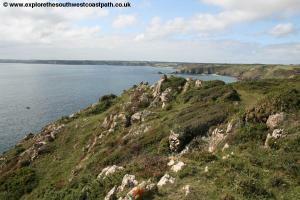 Keep to the coastal edge of this course and continue past the golf course onto the main cliff path, this soon rounds a little rocky cove and then descends into a lovely little wooded valley, which leads to Poltesco. Turn left here on the signed coast path that climbs back up to the cliff top When this track forks, turn left on the most coastal fork to pass a rocky cove at Enys Head. 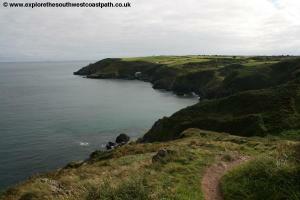 Keep to the main coast path ahead, which heads south and then starts to descend to reveal the village of Cadgwith Cove ahead, a typically secluded fishing village. It is possible to walk inland here to Ruan Minor, half a mile away, which has a bus service to Lizard and Helston if you wish to cut the walk short. 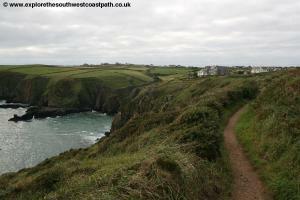 Follow the coast path as it soon becomes a track in front of some cottages that comes down to the road, where you turn left, continuing to descend to the harbour. The beach here is mostly shingle and rock and there are many boats here. Keep to the minor road at the back of the harbour, passing a couple of shops and the toilets. Keep to the road as it begins to climb up on the other side of the harbour and as the road turns off to the right, take the signed coast path ahead. Where this rejoins the edge of the road take the path on the left, immediately off the road again. Keep to this track passing a couple of houses on the right and after passing the second house on the right, fork left on the signed coast path to reach the Devils Frying Pan, a rocky little inlet where the sea has blown a whole through the cliff. 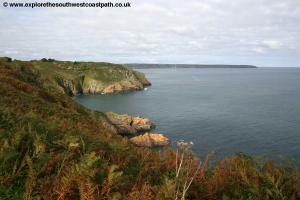 Now follow the good coast path right along the cliff top for the next half mile or so to pass the rocky beach at Polgwidden to the left (there is no access). 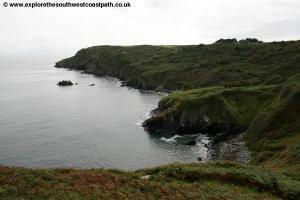 The coast path then descends down to the little road to Church Cove. The road on the right here leads into Lizard village if you wish to end the walk early, but the coast path turns left on the road and then almost immediately forks right on a path back up the cliff. Follow this to pass behind the Lizard lifeboat station. Do not take the path down the cliffs just past this, but continue on the cliff top path. This soon meets a track (Green Lane) which you turn left along and follow out to Bass Point. 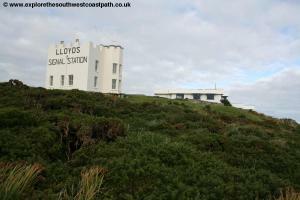 At the point, by a house, fork left off the track onto the main coast path around Lloyds Signal Station. 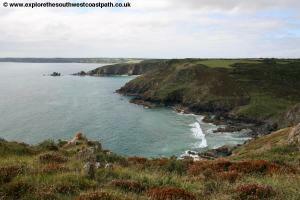 You now follow the good coast path which soon reaches Housel Bay, which has a hotel, The Housel Bay Hotel whose gardens you pass just behind to your right. 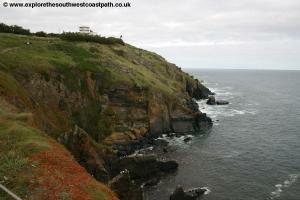 Just past the hotel at a T-junction of paths turn left on the most coastal route just above the beach and follow this good coastal path along the cliff top to Lizard Point lighthouse. 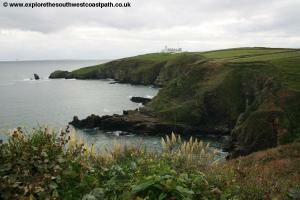 Take the path on the coastal side of the light house to come down to a small car park at Lizard Point itself, the most southerly point on the coast of Cornwall. There are a couple of shops here. 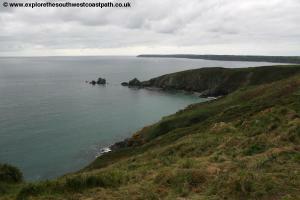 We leave the coast here although this walk ends at Lizard village around Â¾ of a mile inland. Turn right up Lighthouse Road here and keep to this. As you reach the first houses of Lizard village turn right with the road to come to the main village square and green (the latter which doubles as the car park). As you reach the green the bus stop is on the left, by the telephone box. The buses turn around here. 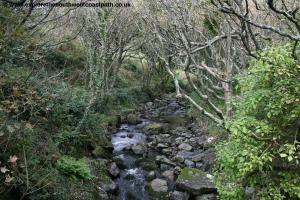 From Lizard village bus First Devon and Cornwall 37 runs hourly Monday – Saturday back to Helston. Some buses serve Ruan Minor and some go direct which means the journey time varies between 35 and 45 minutes. There is a connection, often operated by the same bus here onto Redruth Station as service 34. To get back to Coverack you can change buses onto the First Devon and Cornwall 36 service to Coverack at either RNAS Culdrose or Helston. However unless the connections do not allow it, it is recommended to change at Helston. Most buses on both routes serve Helston Sainsburys and the town centre and you can change at either, although you get longer to make the connection by changing at Sainsburs, but check the timetable as a couple of the buses to Coverack miss Sainsburys. On Sundays the bus from the Lizard runs once every two hours (always via Ruan Minor) however there is no bus service from Helston to Coverack on Sundays. You will therefore need to take a taxi if you are returning to Coverack on Sundays. Here are some photod taken on the walk. Click each photo for a larger version. Ordnance Survey Explorer 103 covers this part of the coast and is available nationwide as well as from on-line retailers. Or see the links below.